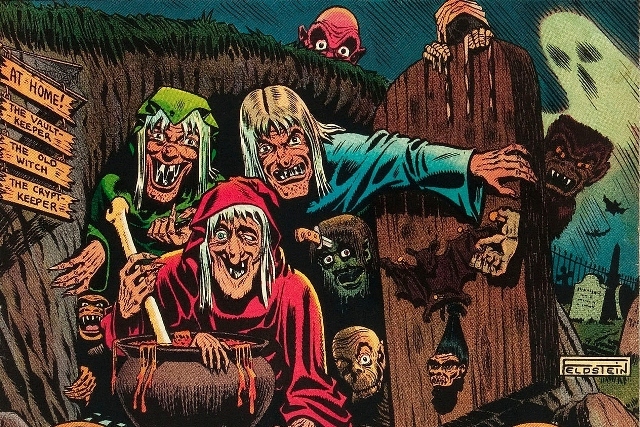 EC Comics Carved the Way! Despite being nearly two decades since I stopped collecting, my kids will tell you I’m a strong advocate for comic books. Back in the ‘80s I was all about the Marvel superheroes before they became the Box Office sensations they are today. I’d often read and re-read the adventures of The Amazing Spider-man, The Uncanny X-Men, The Mighty Avengers, and ROM the Spaceknight (if you aren’t familiar with him, you should check out one of my very first blogs HERE) to my younger brother, Keith. While comics are often dismissed as being childish, many folks don’t realize that most are written at college level. All through junior high & high school my reading skills were better than average and, dismissing the possibility that I’m some sort of a genius, I firmly believe this was due to my devotion to comics which encouraged me to read…a LOT! Aside from improving your skills, comics can be downright influential. I know I’ve touched on the impact that Famous Monsters of Filmland magazine had on some notable names in the horror industry but magazines weren’t the only source of pulpy inspiration. 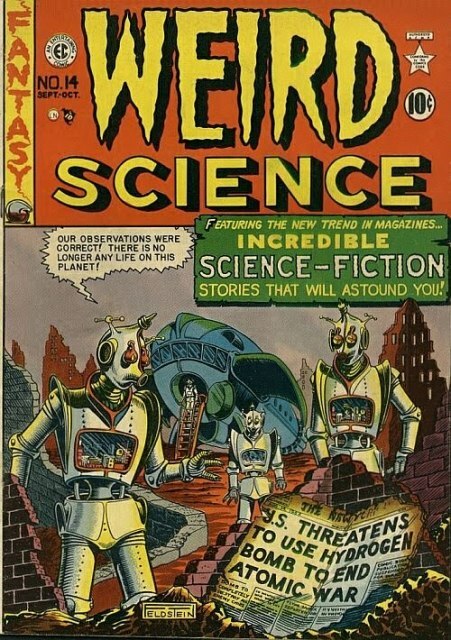 From 1950 to 1955 a small company named EC Comics would carve its own bloody swath into the minds of young genre fans and, unlike the myriad of other horror titles that proliferated during that time, are STILL remembered and loved today. They can also credit such icons as John Carpenter and George Lucas (who not surprisingly was a big fan of their science fiction titles) among their many disciples. I wish I could say I grew up reading these gems along with sharing stories of rushing down the street to my local newsstand, a shiny nickle in tow, seeking out the latest issue of “Tales from the Crypt.” I’d love to reminisce about how I used to stay up late at night and read them under the covers with a flashlight hoping my parents wouldn’t notice I was up past my bed time. Since my parents were both born during the early ’50s, however, it’d be tall tale at best. EC originally stood for “Educational Comics” and was started by Max Gaines in 1944. Gaines had broken away from what would later become DC Comics; using his share to start his own company. 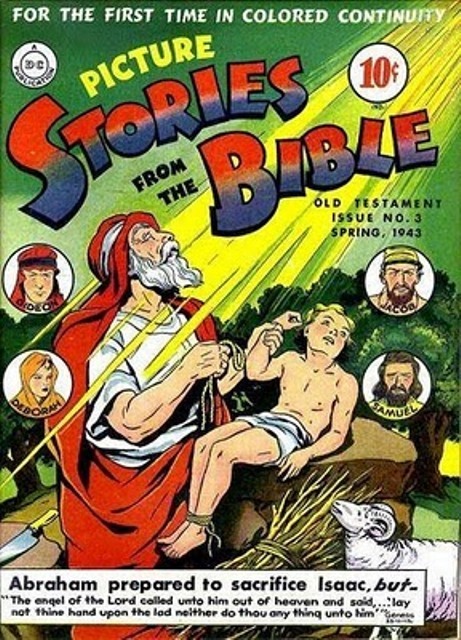 In the beginning, his comics’ primary featured illustrated stories from the Bible along with historical dramas. Not surprisingly, the company’s sales lagged and at the time of Max’s untimely death in 1947 was $100,000 in the hole. Aside from not being the brightest business man, Max apparently wasn’t the nicest daddy either. He was tough on his only son, William, and basically looked and treated him as a total disappointment. When William inherited the company, he wanted nothing to do with his father’s legacy but, at the insistence of his mother, reluctantly took over the reigns. At first he just popped into the office now and then to make an obligatory appearance before learning to appreciate the talented artists in his employ. This would eventually lead to an epiphany of sorts; if he was to be in charge of his father’s legacy, he might as well make it his own. This was never more apparent than when he took the company in an entirely new direction…horror. William Gaines learned that his editor, Al Feldstein, had similar tastes in the macabre which lead to them experimenting with a horror tale or two in their current running crime comics; the first in “Crime Patrol” #15 in 1949. The next issue would feature another scary yarn along with the debut of their iconic horror host, The Crypt Keeper! Soon “Educational Comics” transformed into “Entertaining Comics” with “Crime Patrol” becoming “The Crypt of Terror” in issue #17 before settling into the familiar “Tales from the Crypt” by issue 20. It wasn’t long before the company’s fortune dramatically improved and the underachieving William Gaines would achieve a success his father could never have imagined. The bi-monthly “Tales from the Crypt” was such a hit that EC sprang two more horror titles, “The Haunt of Fear” and “The Vault of Horror.” It would also see the addition of two new horror hosts, The Old Witch and The Vault Keeper. Their role would be the same as their television descendants would be years later concerning the Shock Package of movies, lightening up the dark subject matter with their own style of comic relief. In the 1980’s I discovered these gems via reprints and soon realized that though I was too young to have been impacted by the comics, I was absolutely enamored with the films they inspired. 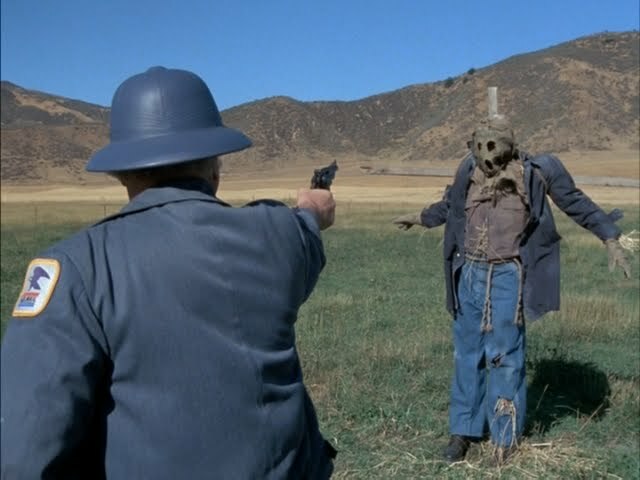 Both John Carpenter’s THE FOG and the incredible 1982 TV movie, Dark Night of the Scarecrow are two of my all-time favorites and feature “revenge from the grave” stories – something that was a major theme in EC’s horror titles. Back in the day, kids couldn’t get enough of them and not only did EC experience a financial boon but also saw their competitor comic companies following suit. 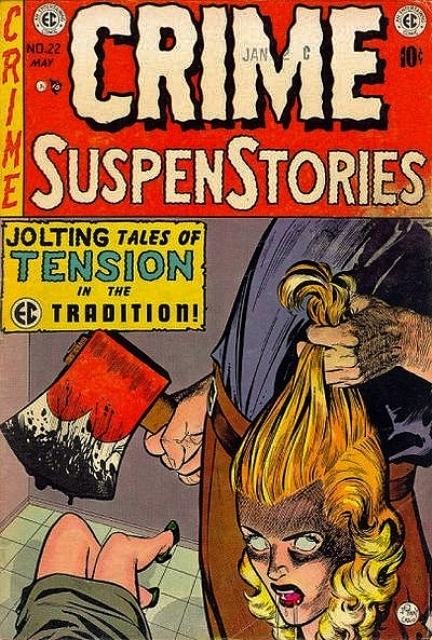 This would all come to an abrupt end in 1954 when a media-seeking psychologist would announce his belief that horror comics led to juvenile delinquency. 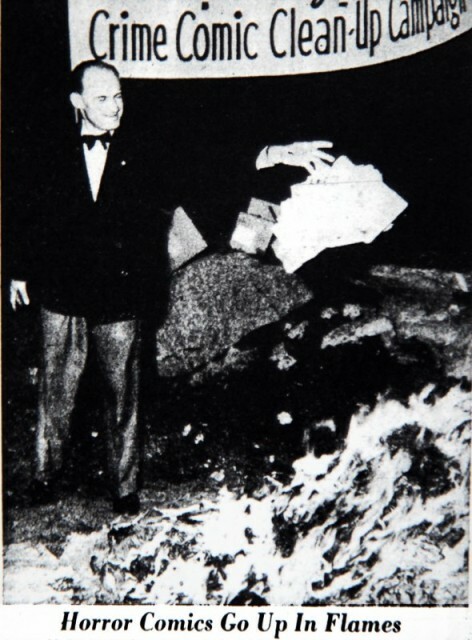 Soon public comic book burnings were taking place and, with fewer establishments willing to carry them, EC had no choice but to cease production. 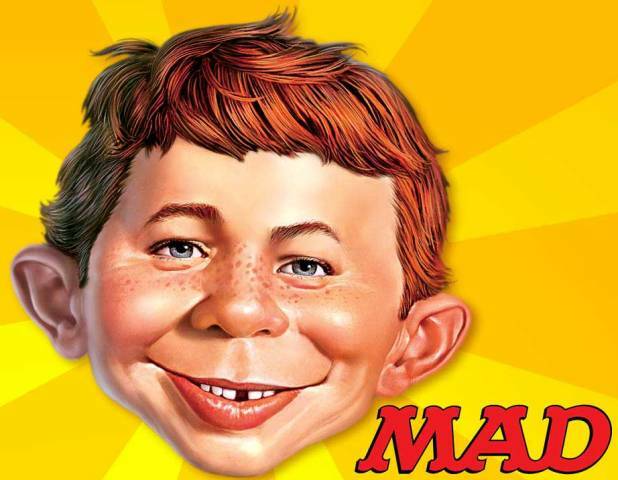 Although “Tales from the Crypt” and its spin-offs were no more EC would live on through the success of one of their comedy titles, MAD (Yes, folks, as in what would later evolve into MAD Magazine). When I was in my ‘20s I bought the hardbound Black & White EC collection courtesy of publisher Russ Cochran. It was a great way to read all these amazing stories but I longed to see them in color. This dream was recently realized courtesy of EC Archives! Though slightly smaller than my previous collection (yet still larger than a comic book) the stories are now not only complete but in bright colors/glossy paper too. These editions were originally being published by Gemstone but have since been taken over by Dark Horse which has been doing an amazing job! Unfortunately, I learned of these collections a bit too late and some of the earlier editions are now out of print. The books that ARE in print go for about $50 each which ain’t cheap. Amazon is a great place to get them at a discounted price but you’d best order hem quick, as it isn’t long before they’re out of stock and your facing collector prices instead. What is currently available at the time of this write up is Tales from the Crypt Volume 3 and Volume 4, “Vault of Horror” Volume 1 and Volume 3, “Shock Suspense Stories” Volume 1 and Volume 2, “Weird Science” Volume 2 and Volume 3, and you can pre-order the upcoming first volume of “Weird Fantasy.” They also have some military themed editions courtesy of “Two Fisted Tales” and “Frontline Combat.” What I’ve mentioned are all affordable now but I’ll be surprised if any are fetching less than a $100.00 in a couple years. As I read through these amazing books, I will be spotlighting each title in individual posts’ also focusing on a few of the amazing artists responsible. One of the things that set Willaim Gaines apart from his contemporaries was his encouraging his artists to use their own styles as opposed to have all the stories share a uniform look and permitting them to sign their work, something uncommon for anthology comics at the time. And that being said, it is time for me to grab a flashlight and dive under the covers with my latest Tales from the Crypt! This entry was posted in Comics & Superheroes and tagged EC Comics, Haunt of Fear, Tales from the Crypt, Vault of Horror, Weird Fantasy, Weird Sceince, William Gaines. Bookmark the permalink. ← Terror Dave’s “Hidden Horror” Contest!